Our soul discovers itself when we come into contact with a great mind. It is not until I had realised the infinitude of Goethe’s mind that I discovered the narrow breadth of my own. 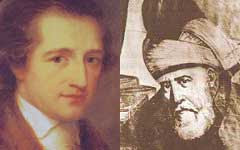 In one of the poems of Iqbal, Goethe meets Rumi in heaven and reads his play Faust. Rumi offers feedback. Following is a translation by Mustansir Mir (slightly modified by me). Happened upon the Master of the East. Though not a prophet, he is possessed of scripture! He read about the pact of the Devil and the doctor. And created this old world anew. You have been a witness to the birth of the pearl in the shell. Or is fit to reach these portals. JazakAllah! When the translation is so beautiful, how inspiring would be the original! And ...When in 1831 the cholera appeared and killed many people he consoled a friend: "Here no one can counsil the other; each one has to decide on his own. We all live in Islam, whatever form we choose to encourage ourselves." How much more steeped in Islam was Goethe then! The messages of love of the small, every little good or bad that happens, happens for a reason. But we understand not, and are "impatient"
Reading your posts on Goethe, makes one realize how truly tiny and small we all are, here in this land of the "pure"
Can we then call Goethe a Sufi? was he a follower of Rumi as well? This REPUBLIC OF RUMI has fascinated us with the awesome posts from KHURRAM SHAFIQUE and thoughtful, insightful and scintillating comments from the regular commentators specially Connie Nash, her comments just makes one feel so prosperous about the subject and the joy of that we experience is beyond the measure of words. Goethe is an immortal artist and like IQBAL, our modern day finest Novelist MILAN KUNDERA has also characterized him in one of his novels IMMORTALITY. The novel portrays Goethe and Ernest Hemingway conversing in the afterlife. Structure of entropy, Connie, Bushra, Farrokh Namazi, Akhtar, Hena, thanks. This post has received more feedback than I was expecting. A revival of Goethe in the East is also long overdue. Let's hope that it happens. nice work.may i link you?